With our love for wine, I knew it needed to have an important part in our big day...besides just drinking it :) I had been struggling with deciding on a guest book for awhile and had settled on a picture book. I was satisfied but not thrilled with my decision. To be honest, I didn't want to spend anymore time brainstorming. 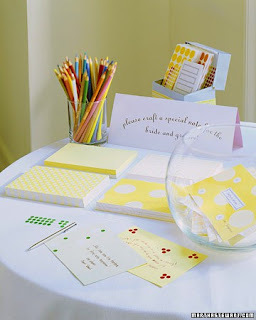 Click here for some ideas of other guest book options. Then, one of my brides I worked with this fall used a large wine bottle with her own label as their guest book. I loved it! I want a large wine bottle like the one below and silver markers for all of our guests to sign. Eventually, we hope to live in a home where we can put this on our bar. But then, I changed my mind when I saw this idea. We are going to pick two bottles of wine, one for our one year anniversary and one for our five year anniversary. Kyle is already excited to choose the two bottles! We're doing to do both ideas and give the options to our guest to choose. We won't have as many bottles as this picture, but the overall look is beautiful and what I want to recreate. I like the candles and signs to let the guest know what each bottle represents. 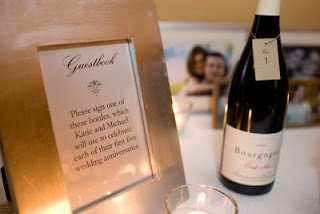 The only thing I did not like about the wine bottle as a guest book is that guests can't leave us notes or messages. So I'm going to include an advice jar. My only challenge is for these two ideas to go together and for it to fit into the rest of my theme. Off to Paper Source to find some great options!